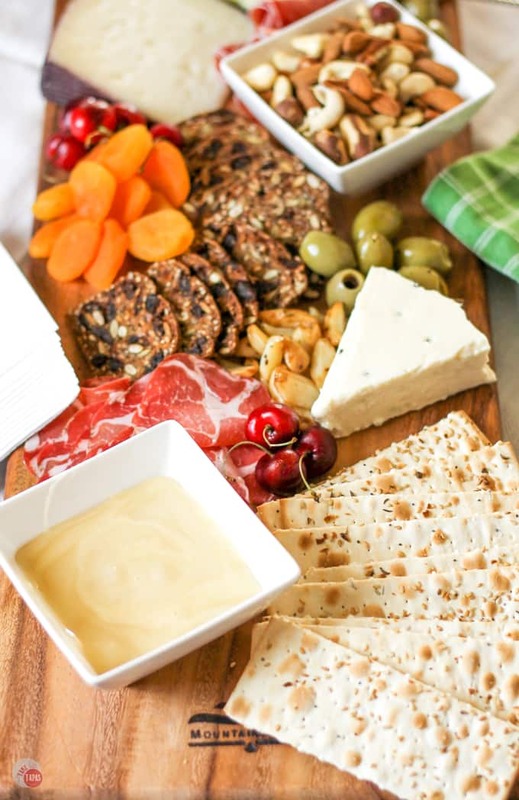 The perfect summer appetizer is an antipasto platter cheese board. Full of fruits, meats, cheeses, nuts, and olives it is perfect for satisfying all your guests at the same time! Want to know what the perfect thing to serve at your summer party? A cheese board! If you build it they will come…to your party. Sorry for the movie reference. 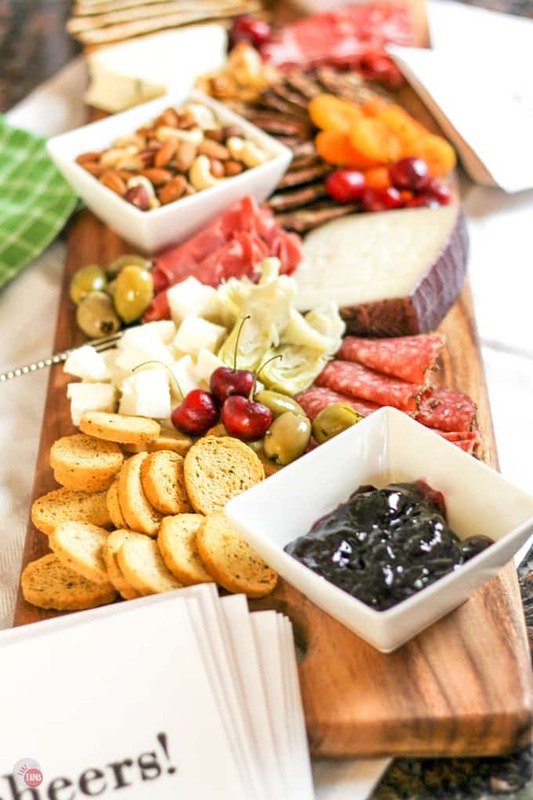 In this post, I am going to show you how to make an antipasto platter & cheese board that will be the centerpiece of your party and has something for everyone. The hardest part about a party, for me, is making sure the menu has something for everyone. 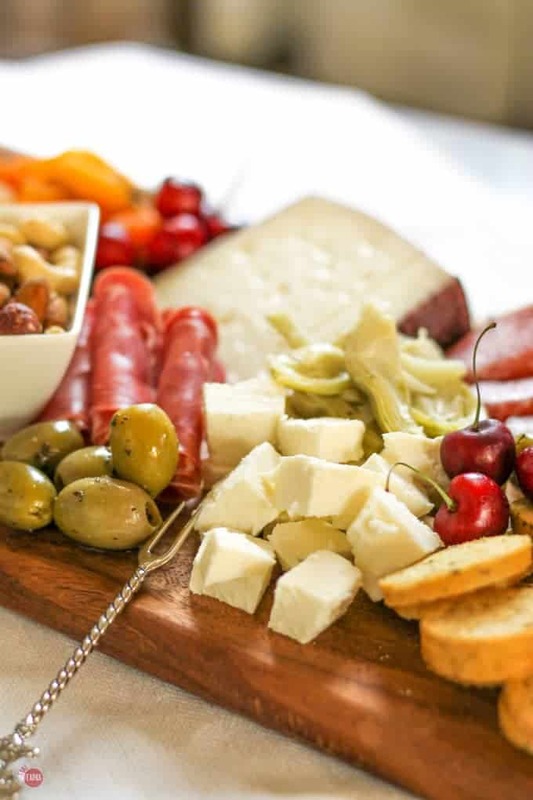 With so many people on restricted diets, having food allergies, or just plain old picky, having an antipasto platter or cheese board is the best way to get a little something for everyone without blowing the bank or buying enough food for the whole neighborhood. 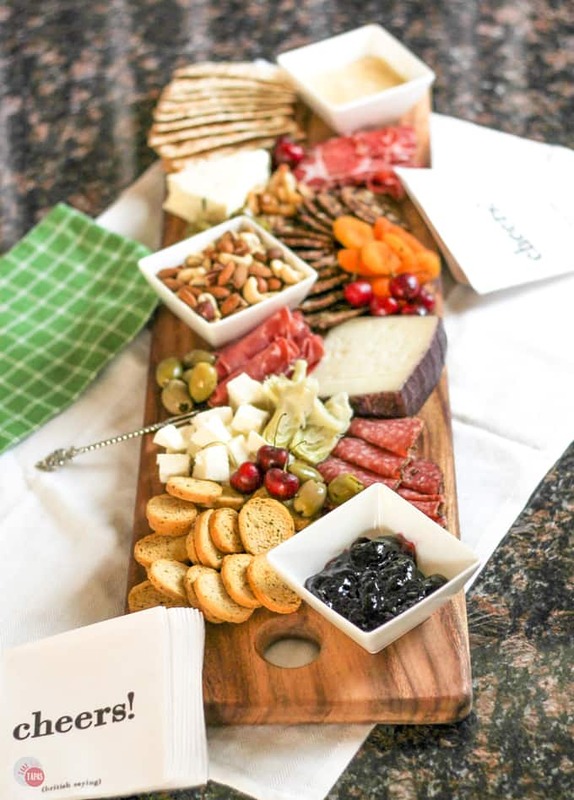 My favorite thing about a cheese board is that you can prepare all the ingredients ahead of time and place it on your board when you are ready to serve it to your guests. 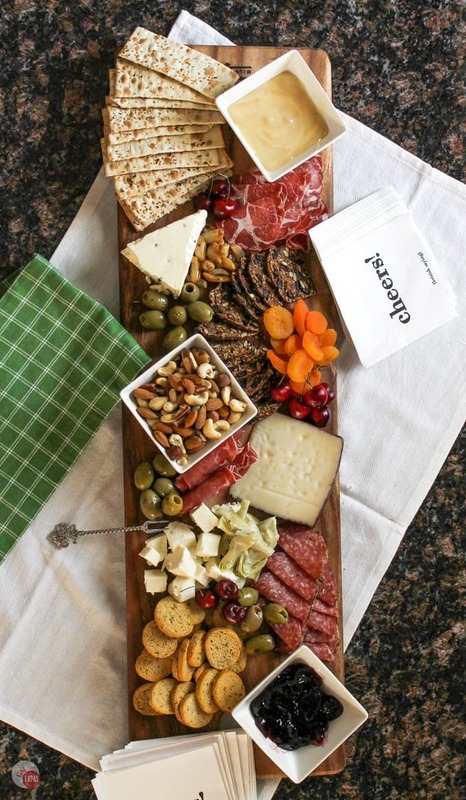 Prepare by finding a board or platter to use as your base. I found this wood board and love it!!! All it takes a little bit of olive oil rubbed on it to keep it looking nice. Next, I gauge my landscape. My board only holds so much so I start by placing the bowls that will hold the condiments and spreads that need containers. My wine jelly is a perfect addition to any antipasto platter or cheese board and fits nicely in these tiny bowls or ramekins. Then I fill in all the blanks spaces with my meats, cheeses, fruits, nuts, olives, and crackers. These loose items are easy to arrange in tight spaces and around other items. The great thing about an antipasto platter and cheese board is the variety of items but what if you want to “beef” it up a bit and make it more of an antipasto? When I start to think about what I want and need for my antipasto platter cheese board I always start with the cheese selections. Thinking about textures and flavors, I like to start with 3: One mild, one medium, and one strong. Fresh Mozzarella is perfect for the mild choice. It is creamy and goes well with a variety of other flavors. Next, I choose a goat cheese because it has a slightly stronger flavor, a texture that doesn’t spread but cuts easy making it a great cheese for eating by itself or on a cracker. My third choice is usually a strong sharp cheddar or a blue cheese. A pungent and Earthy Gorgonzola that is great for this cheese choice. After choosing my cheeses, I head to the cracker aisle. Cheese and crackers go hand in hand so choosing the right crackers to go with your cheeses are a necessity. If you have a creamy, spreadable cheese you have to make sure you have a cracker that isn’t too delicate or people will be cracking their crackers all day. Not fun and the wording isn’t either! LOL! I choose a long cracker with some herbs, a thick bread-like cracker or toast usually with garlic, and then a dark bread/cracker with a stronger flavor. On this particular cheese board, I found a fig and olive toast that will hold its own when eaten alone and makes a great compliment to any of the cheeses and snacks on the cheese board. After cheese and crackers, you need accompanying spreads and snacks. 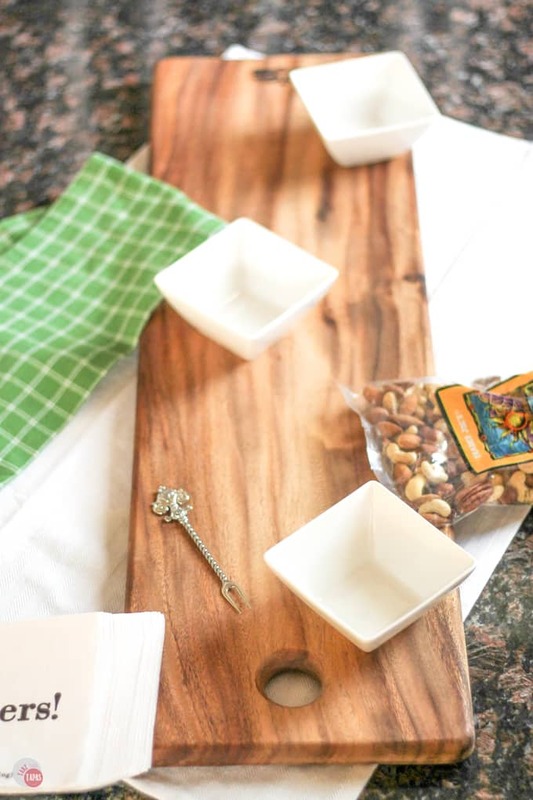 Nuts are a must, so a salted or roasted bowl of mixed nuts is the way to go. I also like to throw in some fruits, be it fresh or dried. I have such a big board I decided to add both. Grapes are the “go-to” fresh fruit but I love cherries or even fresh figs. Just be sure that the fruit is easy to handle. No cut melon or the juices will make the rest of your board soggy and you will have to have forks too. Cutlery defeats the purpose of finger foods! Now if you are serving other foods at your party this can be the extent of your cheese board. 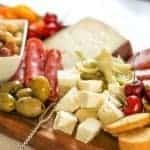 But if cocktails and snacking are the name of the game, then beef up your cheese board and make it a tapas antipasto platter & cheese board too. To accomplish this part I just added a few ingredients normally found on an antipasto. I wouldn’t go with fresh veggies like sliced peppers or carrot sticks, because these belong on a different tray altogether. This summer tapas antipasto platter cheese board is meant to fill up your guests with minimal effort! For other ideas for your summer antipasto platter and cheese board check out my Winter Cheese Board Tutorial. Some of the ideas in this post work well for the summer too! The perfect summer appetizer is an antipasto platter & cheese board. Full of fruits, meats, cheeses, nuts, and olives it is perfect for satisfying all your guests at the same time! Make sure you board is ready to go! Slice your meats and roll them up. Arrange all your ingredients on your board focusing on a spreading the cheeses out over the entire surface of the board. Surround the cheese selections with a meat and a cracker selection. Preferably ones that you would want your guests to try together. In between your cheese and meat sections, tuck your fresh and dried fruits, spreads, and nuts. Don’t forget the napkins, small plates, spoons and knives for spreading and slicing and maybe even some toothpicks. This post was sponsored by Stella Cheeses. This is what the perfect Cheese board looks like. I’ve been looking for ideas to make mine better. Thank you! Looks so yummy! You did a great job on the arrangement. This is what heaven looks and tastes like. For sure! And in heaven you can eat it all and not gain any weight! Give me a glass of wine + this and I”ll be one happy girl!! This looks fantastic! Thanks Liz! I think this will be dinner a couple of times this summer! Thanks D! I ate it for dinner after I shot the pictures.